This service is generally used for newborn children though adults can also benefit from it. The idea is to choose a name which will resonate with the mind of the child and be helpful for the rest of their life. There are two methods of choosing the name: the first is based upon the position of the Moon in the nakshatras. This is very simple method and quite popular, the astrologer finds out what the initial sound of the name should and gives some suggestions based on that sound ($25). A more complete and sophisticated method is to examine the horoscope, determine which is the strongest planet and then choose the name based on the letters associated with this planet and choose a name starting with these letters ($100). This service can also be used for choosing the name of business, corporation, product, society, club or anything that requires a name. I want to get an Astrological Name. In this scene from the 10th canto of Srimad Bhagavatam we see the great sage Gargamuni performing the name giving ceremony for Their Lordships Krsna and Balarama. 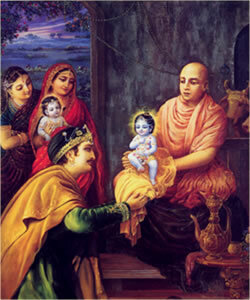 This is the first Samskara (sacrament) performed after the birth of the child. Samskaras are designed to make a spiritual impression on the soul.